When was the last time you went down Naklua Soi 18, a.k.a. Soi Wong Amat, which runs parallel to the beach all the way to Soi 16? I remember the road when I first moved to Pattaya almost 40 years ago when the only hotel of note was the Wong Amat hotel and bungalow complex catering mostly to German tourists. It wasn’t easy getting there unless you had your own transportation in the form of a little motor bike, which was the mode of travel for most people in Pattaya, if you could afford one. Things have changed quite a bit in the past four decades along this once almost deserted road. The street is now lined with hundreds of restaurants, hotels, condominiums and shops, including dozens of 7-11s and Family Marts, some even situated right next to each other. Chatchawal Supachayanont, GM of the Dusit Thani Pattaya. There must be a real big demand for so many of these mini marts and shops, I wondered. 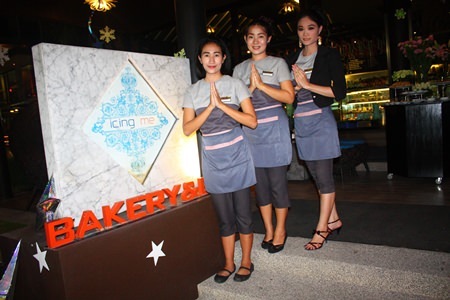 My thoughts were answered as I arrived at the Icing Me Restaurant & Bakery located at the street front of the Long Beach Hotel on the corner of Naklua Soi 16. Having been given a rowdy welcome by members of the GM Gang, I settled in my chair, took a sip of red wine and gazed out the window. I was mesmerised by how the intersection was being transformed right before my eyes. It was dusk and shadows became long. The street lights were switched on and as if from the sets of a Fellini movie, the intersection came to life. For a moment I thought I was in some small town in India, replete with the hustle and bustle of people crowding the streets, strolling around, oblivious of cars and buses small and large that zig-zagged their way around the masses, just barely missing them. This looked like the early days of Walking Street when it was still called the South Pattaya strip. I was overwhelmed by this sensation of déjà vu. I was jolted back to present day as I heard the soothing voice of our host, Sanpech Supabowornsthian, GM Long Beach Garden Hotel & Spa Pattaya, addressing the gathering of general managers and executives of the hotels in Pattaya. 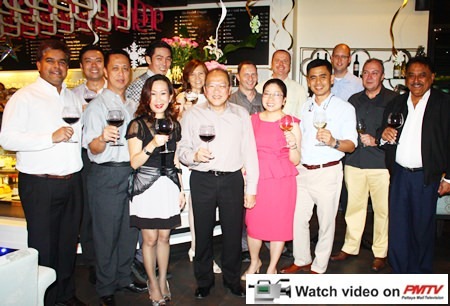 Chatchawal Supachayanont, the head of the GM Gang, welcomed his friends and colleagues and graciously welcomed Rudolf Tröstler, the new general manager of Hilton Pattaya to the gang. Sanpech Supabowornsthian, GM Long Beach Garden Hotel & Spa. 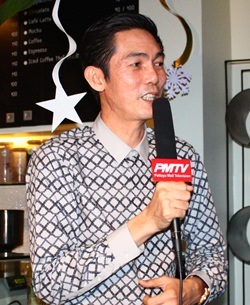 He commented on the uniqueness of the Icing Me restaurant and said that it was a nice and cosy place for friends to meet, at the same time thanking Sanpech for his kind hospitality. Though the political climate in Thailand seemed gloomy, Bundarik Kusolvitya, President of the Thai Hotels Association (Eastern Chapter) was very optimistic about the hotel and tourism business in general. 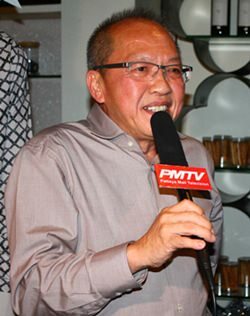 Commenting on the drop in tourist numbers from China, Bundarik said, “This setback is only temporary. The Chinese government has put some measures in place to protect their citizens from being exploited by unscrupulous tour operators and want to put a stop to those unfair practices. I am confident that once the new policies are in place, the numbers would increase again. “Tourism to Pattaya has a bright future. We still see an influx of Russians, Indians and Koreans to our city and the eastern region,” she continued. “I am also pleased to note that tourists from Europe including Germans and the British still come in large numbers. Bundarik Kusolvitya, President of the Thai Hotels Association (Eastern Chapter). “The best piece of good news is that after a break of almost two decades, the Japanese tour operators have finally put Pattaya back in their travel brochures as of the next tourist season. The Japanese have come to realize that Pattaya does not have a bad image after all and that we have positively transformed into a family oriented destination. The evening ended on a high note and as we walked out of the restaurant and into the street, I reminisced about my old friends from days gone by, some of whom are with us no more, when we were young, energetic and carefree, walking up and down the South Pattaya strip, joking and laughing as we bar-hopped until dawn. 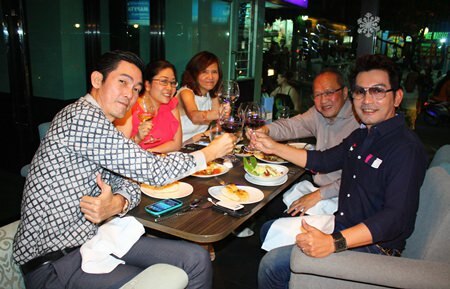 Prayuth Thamdhum (GM Montien Pattaya) arrives just in time to drink a toast with his friends. (l-r) Tony Malhotra (Pattaya Mail), Nopporn Kanchanamanee (District Sales Manager of Thai Airways), Neoh Kean Boon (RM Dusit Thani Pattaya), Sanpech Supabowornsthian (GM Long Beach Garden Hotel & Spa), Jitmanee Siravithayavanich (Way Hotel), Bundarik Kusolvitya (President of the Thai Hotel Association – Eastern Chapter), Chatchawal Supachayanont (GM Dusit Thani Pattaya), Danilo Becker (RM Thai Garden Resort), Yuwathida Jeerapat (MD Hotel J Pattaya), Holger Kroninger (GM Siam Bayview & Wave Hotels), Sittidej Rochanavibhata (General Manager Cape Dara Resort), Rudolf Tröstler (GM of Hilton Pattaya), Rene Pisters (GM Thai Garden Resort) and Peter Malhotra (Pattaya Mail). Welcome to Icing Me Bakery & Bar. Where would we be without imagination?